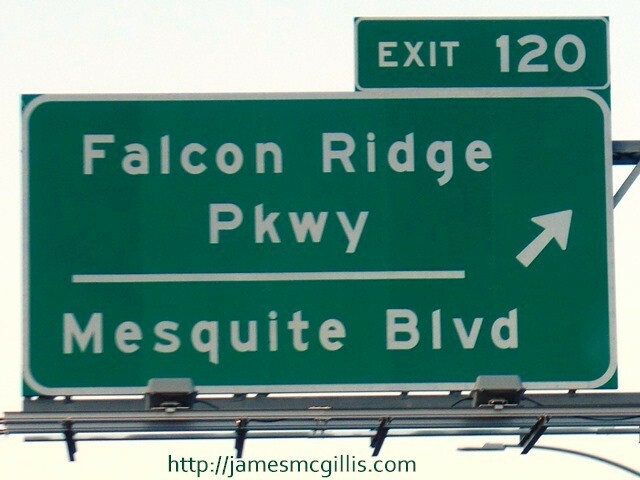 In May 2014, I departed Casa Carrie in Simi Valley, California, heading for Mesquite, Nevada. While my ultimate destination was Moab, Utah, Mesquite stood half way along my route. To complete my trip to Moab in only two days, I planned to travel 375 miles each day. When towing a travel trailer, that distance approaches my outside limit for daily travel. After merging on to Interstate I-15 North, my trip to Moab would continue on Interstate I-15 and I-70 almost all the way. Although the archaic speed laws in California require large trucks and autos towing trailers to proceed at no more that fifty-five miles per hour, I find it safer to travel on the Interstate at between sixty and sixty-five mails per hour. Why California does not synchronize the speed between towed vehicles and other traffic is an open question. For as long as I can remember, California has stuck to its slowpoke truck and trailer speed limits. Throughout the Four Corners region, trucks, trailers and autos all have the same speed limits. On Interstate I-5 North, the high desert cities of Victorville, Barstow and Baker offer slight relief from the boredom of transiting across the Mojave Desert. 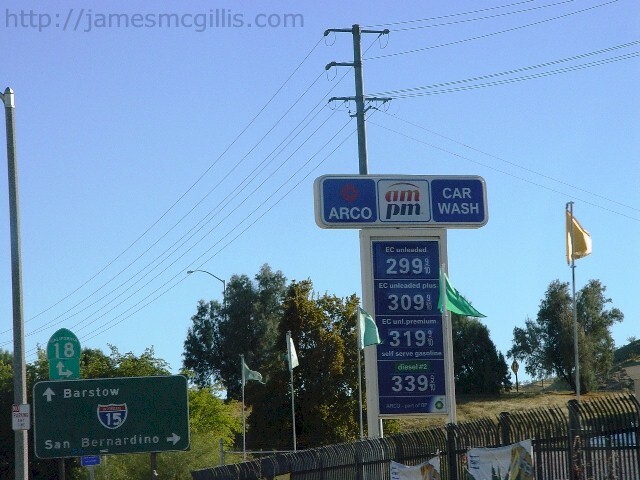 In order to save on fuel costs, I usually stop at the Love’s Travel Center in Barstow. 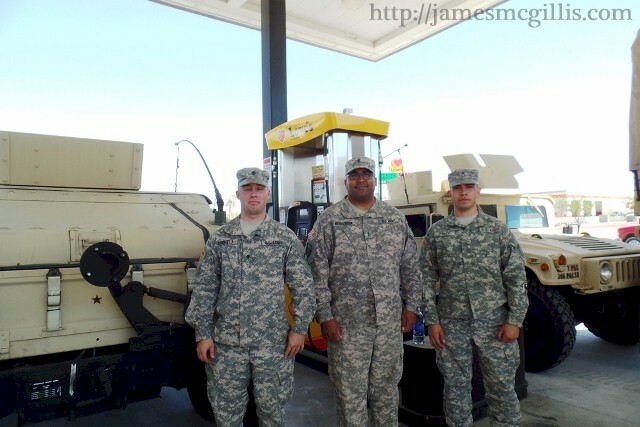 Upon arrival, I found a convoy of two U.S. Army Reserve Humvees and a larger transport truck stopped for refueling. In speaking with three of the team members, I discovered that they were traveling to nearby Fort Irwin for two weeks of Reserve training exercises. On a previous trip to Moab, I had seen a surplus early model Humvee stripped down and converted to off-road use. With no armor at all, the older model Humvees became potential deathtraps during Iraq War combat. 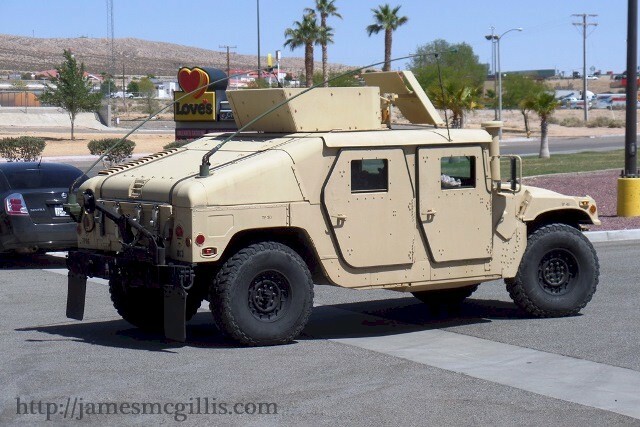 The current model Humvees that I saw in Barstow featured heavy steel-plate exteriors, blast-resistant doors and steel armor built into their undercarriages. With no front-end crash protection, and unarmed gun turrets up top, these Army Reserve Humvees looked sleek, but not yet combat ready. During my fuel stop, I remembered that I was heading for two weeks of fun and adventure in the Four Corners region. For the following two weeks, the reservists would engage in war games and training at the one-thousand square miles of open desert at the nearby National Training Center. With Memorial Day fast approaching, I was happy to have such dedicated and talented individuals training to protect our liberties in the United States and abroad. After I thanked the Los Alamitos, California based reservists for their service, they headed out. Heading north from Barstow, I soon passed the turn-off to Fort Irwin. By then my new friends from the Army Reserve were entering the gate at the “fort”. 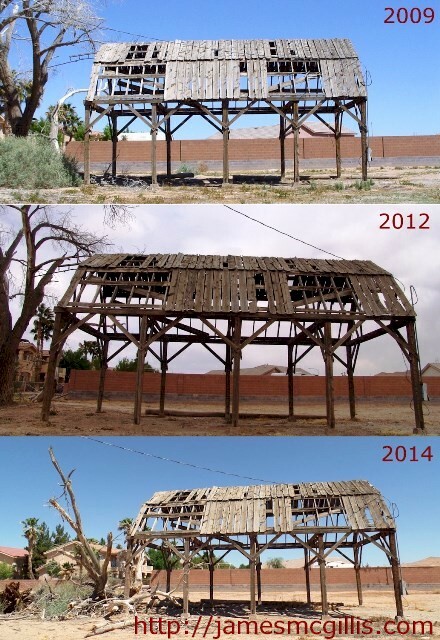 Fort Irwin’s name helps tell the story that in 1846, the U.S. Army created a rock fort at nearby Bitter Creek. From there, the U.S. Army Mormon Battalion and others chased supposedly marauding Apache, Shoshone and fugitive Mission Indians from Mission San Gabriel, near Los Angeles. Although some stole horses, guns and food from travelers along the Old Spanish Trail, most Indians in the Mojave Desert exemplified the notion of nomadic loners, seeking no contact with outsiders. 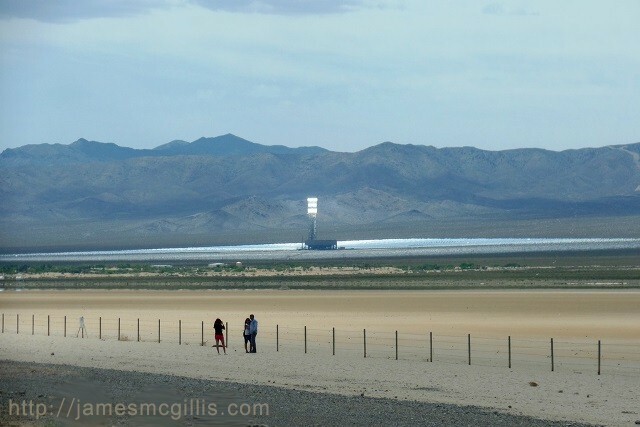 Soon, I came upon Ivanpah, California. Ivanpah shares an otherwise desolate valley with Primm, Nevada. There I got my first blinding look at the glint and glare from the new Brightsource Solar Thermal Plant in operation. In May of 2012, I had passed that place during construction of the controversial, three unit active-solar power generating station. At that time, the tops of the three receiving towers were dark, as if shrouded in black cloth. On this visit, I noted that the top sections of each tower shone with white light seemingly as bright as the sun. Shimmering in the air to one side or the other of each receiving tower was what looked like white mist. In reality, the mist was solar plasma, caused by the concentration of light from many mirrors. As operators need more power, they use computers and electrical actuators to change the angle of up to 356,000 mirrors, each the size of a garage door. As a result, operators can redirect the reflected sunlight from a focal point in the desert sky to a receiving area at the top of each tower. Since adjacent air temperatures created by the solar plasma are so high, no one yet knows the long-term effects on the desert environment. 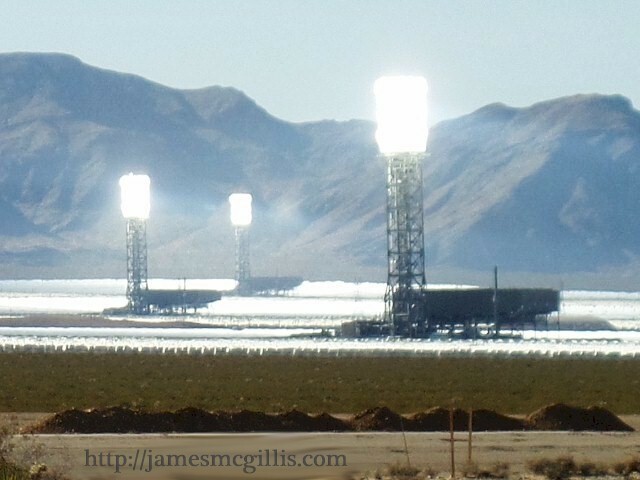 In a recent Los Angeles Times article, I read that a number of native birds had perished in the solar flux at Ivanpah. Some experts hypothesize that prolonged focusing of eyes on the solar receiving towers could burn our retinas. I thought to myself, “Shouldn’t that be illegal?” One thing is for sure; you will no longer see a Desert Tortoise basking in Ivanpah Valley’s desert sun. After 15,000 years of human cohabitation with the Desert Tortoise, politicians decided that the terrapins must go elsewhere, all in the name of “renewable energy”. 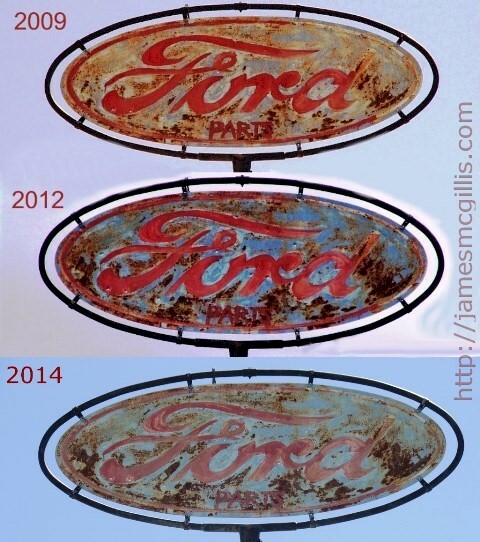 Using the double-speak of Mega Solar; they had to “destroy the desert in order to renew it”. As my rig descended the grade into the Ivanpah Valley, I kept my speed below sixty miles per hour. Thinking that I might get a good photo of the towers, I lowered the side window on my vehicle. Although the ambient temperature that day was about 90 °F (32 °C), heat radiating from the solar thermal generators was palpable on my skin. The feeling reminded me of the rays that emanate from a parabolic electric heater. With its vast array of mirrors and three thermal collecting towers, I discovered that Brightsource Primm had a “heat island” effect far greater than even its massive size suggested. The good news is that without the previously available multi- billion dollar loan guarantees and tax rebates, no further solar thermal generating plants like Brightsource Primm will see the light of day. After that surreal experience, I proceeded past the lure of Primm’s several casinos, driving north toward Las Vegas, Nevada. 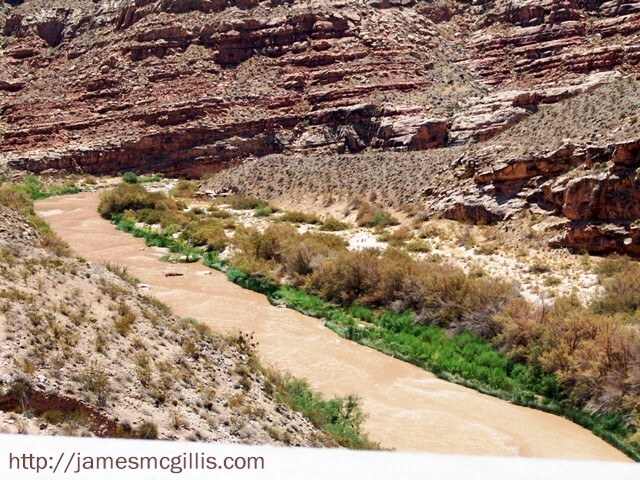 My goal was to reach Mesquite Nevada, ninety miles north of Las Vegas before dark. With that in mind, my visit to Las Vegas would consist of a “drive by” on I-15 North. After almost two decades of expansion in Las Vegas, I-15 has reached the limits of its right-of-way. With six or eight lanes in each direction at the southern end of The Strip, the road and its connectors can carry a tremendous volume of traffic. Ironically, when a driver reaches North Las Vegas, there is usually a traffic snarl. There, highway planners provided too few lanes to handle the through-traffic heading out of Las Vegas to the north, east and west. Near the southern end of The Strip, the Luxor Las Vegas Hotel is visible from the I-15 freeway. In a ghostly repeat of what I had just seen at Ivanpah, the Luxor’s thirty-story tall pyramid reflected golden hues of sunlight off its mirrored glass surface. 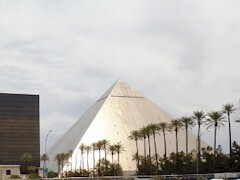 Originally built in the early 1990s, the Luxor received a makeover in 2008. In a classic case of Old Energy thinking, MGM Resorts International failed to take advantage of New Energy. 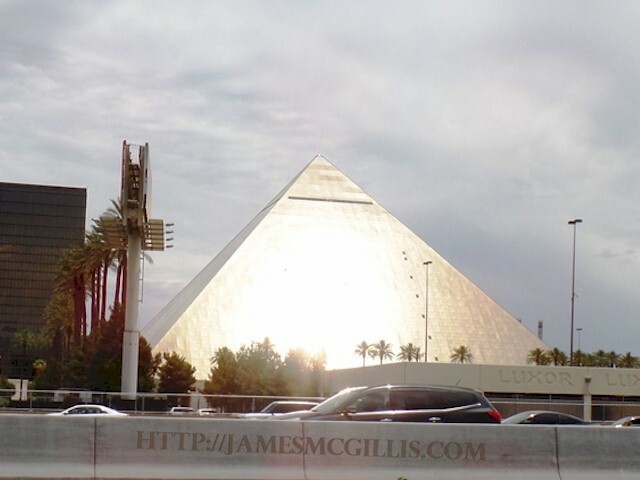 Rather than retrofitting the Luxor pyramid with photovoltaic solar panels, they opted for the “golden glow” effect of solar reflective glass. With business as usual in Las Vegas, appearances trumped energy efficiency and common sense. I wondered how much electrical energy from Brightsource Ivanpah might be powering air conditioners at the Luxor. About twenty miles north of Las Vegas, I exited I-15 North at U.S. Highway 93, also called the Great Basin Highway. If the Ivanpah Valley is California’s version of the new Industrial Desert, the area north of the Las Vegas Motor Speedway and south of the Moapa River Indian Reservation is a no man’s land dedicated to the Old Industrial Desert. Despite hosting a large photovoltaic panel array to the west, an open pit mine adjacent to I-15 and the natural gas fired Harry Allen Generating Station dominate the landscape. Adding environmental insult to injury, a nearby chemical loading depot disperses clouds of white powder and dust across that desolate valley. 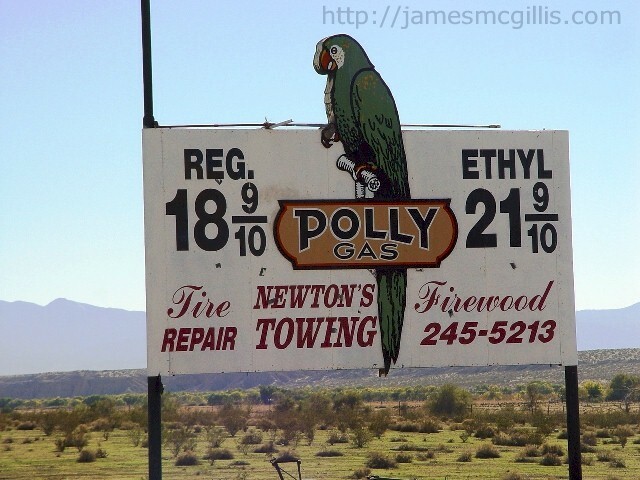 A truck stop in the desert attracts all kinds of people and vehicles. Other than the convenience of yet another Love’s Travel Center, I would not consider stopping in such a ravaged environment. From a person who converted his pickup truck to look like a can of Monster Energy Drink to a severely overloaded Nissan Titan pickup, I stood agape at the unusual scene. 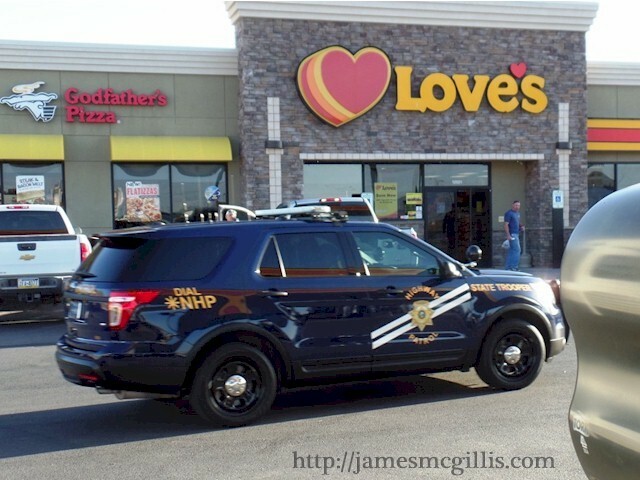 Prior to my departure, I spotted a Nevada Highway Patrol (NHP) vehicle exiting the parking lot. Other than some low-slung lights on its roof and official markings on its sides, the vehicle looked like any contemporary Ford Ranger SUV. In order to identify the occupant as clearly as possible, the words “Highway Patrol” and “State Trooper” blazed across the front fenders and doors of the dark blue vehicle. In a nod to mobile communications, “Dial *NHP” occupied each rear quarter panel. Back again on I-15 North, I steeled my eyes and made myself ready to stare down any ersatz militiamen I might soon encounter along the highway. Before reaching my destination in Mesquite, I had to transit the area held by gun-toting folks who see rancher Cliven Bundy as their hero. In the aptly named “Bunkerville”, militiamen stand guard over an overgrazed desert where rancher Bundy refuses to pay decades’ worth of cattle grazing fees to the federal government. Apparently, it is lost on his para militarist protectors that if we all paid our fair share of fees and taxes, we could create a sustainable environment and have lower taxes for all. 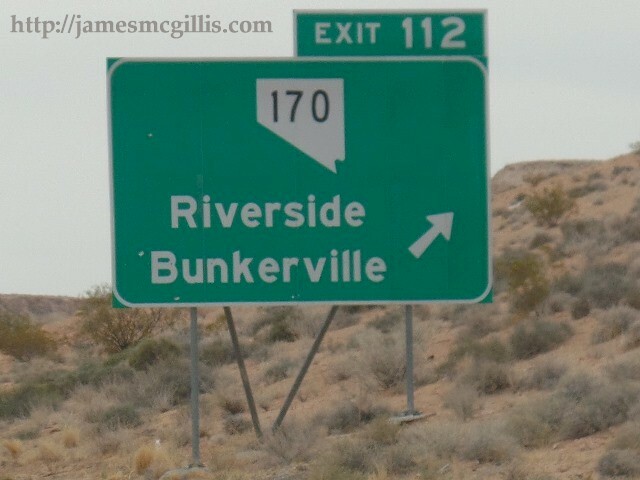 After taking the off ramp to Bunkerville, I lost my way trying to find the place. Given my stand on gun violence, perhaps it is best that I did not meet up with any trigger-happy men dressed in camouflage gear. 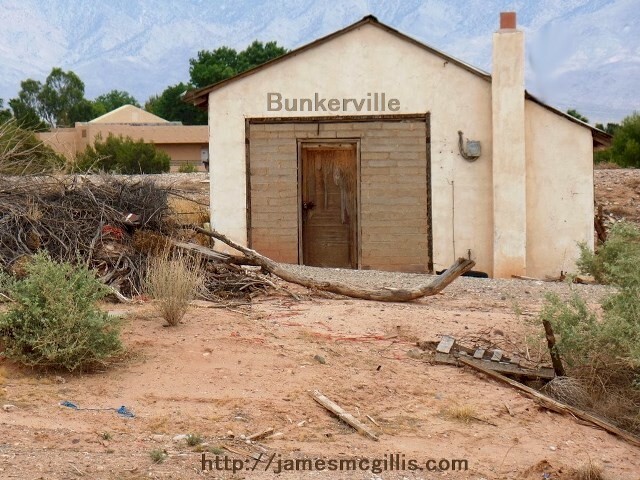 On my foray into that unfamiliar world, I did find the original Bunkerville bunker. As one might expect, it was a windowless shack with heavy wooden doors. Approaching the bunker cautiously, I called out, “Cliven, Cliven… are you there?” Alas, no one answered. 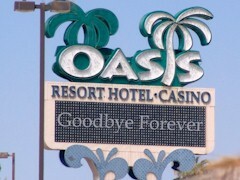 After my visit to virtual Bunkerville, I proceeded to Mesquite and to the “Oasis Resort Hotel and Casino” RV Park . 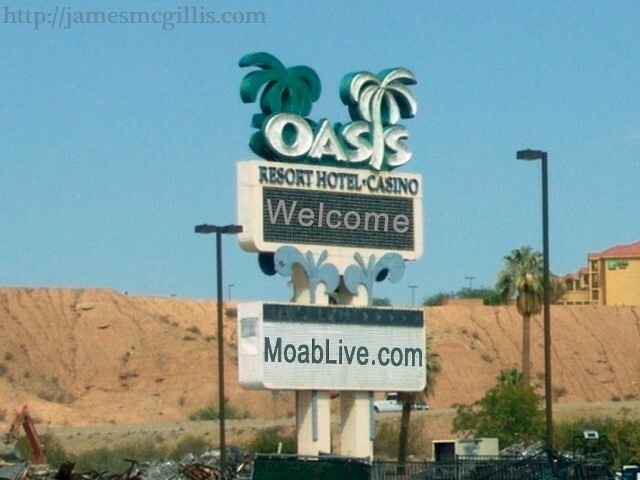 Only a few years ago, the Oasis Resort had welcomed my arrival with a huge “Welcome MoabLive.com” on their lighted message board. 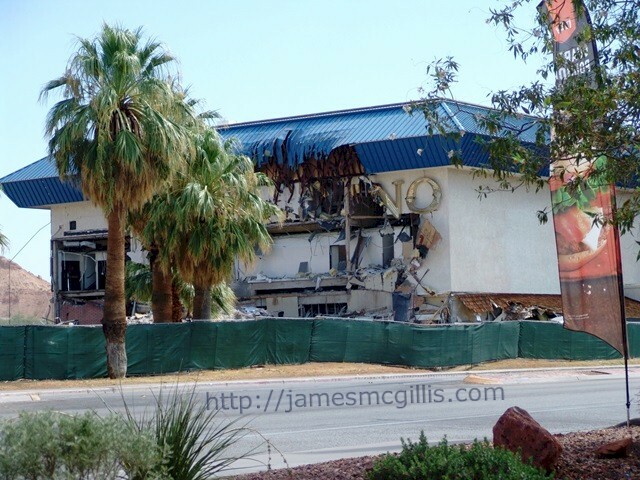 By May 2014, the resort hotel, casino and even the lighted tower sign were gone. 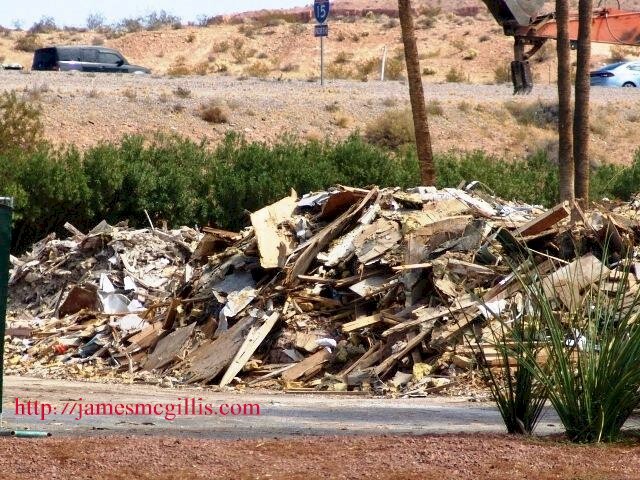 From my previous visits, I knew that Mesquite has an ongoing reputation for destroying its highway heritage. 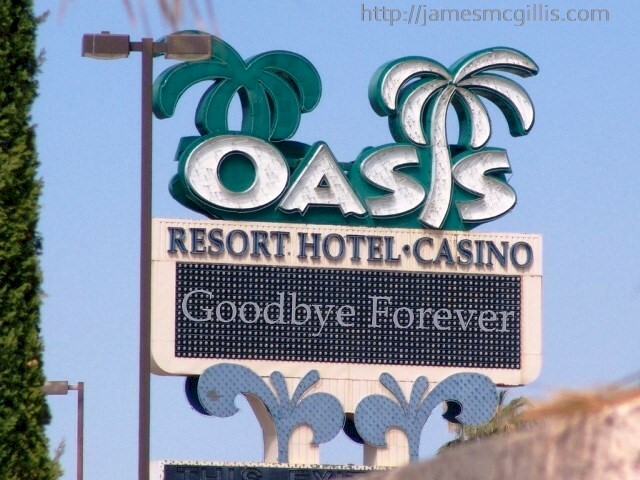 I can understand demolishing an obsolete casino, but removing the venerable landmark that was the Oasis sign is just plain dumb. 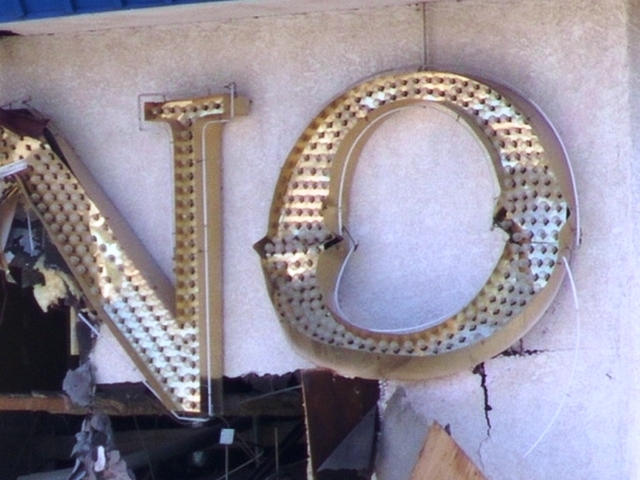 Would Las Vegas tear down its classic 1960’s “Welcome to Las Vegas” sign? 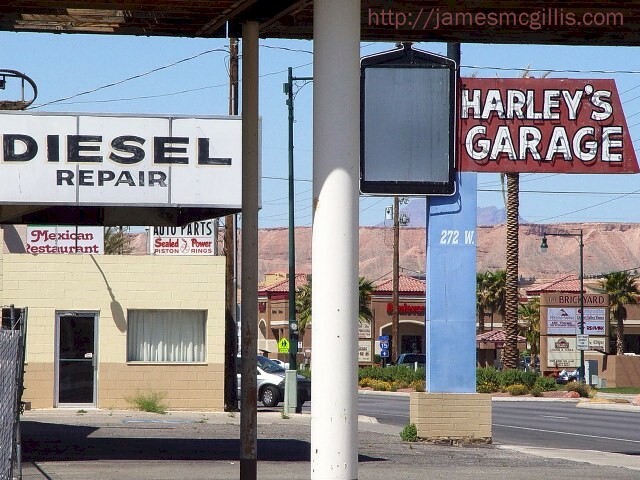 In Mesquite’s zeal to become a thoroughly sanitized city in the desert, it has consistently destroyed its once quaint highway history. 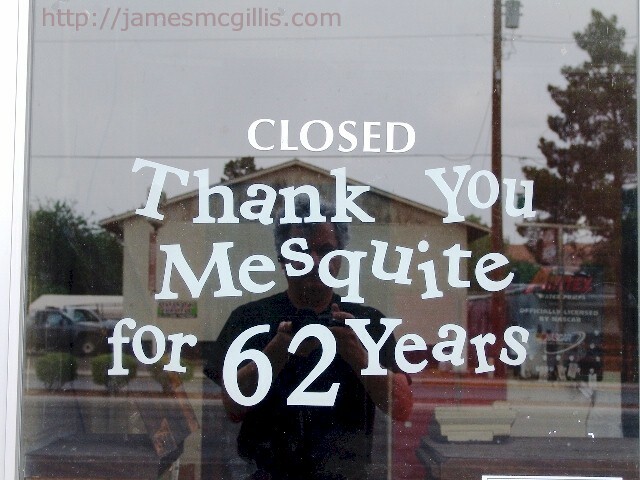 After viewing the destruction, all I could say was, “Good luck, Mesquite, Nevada”. On August 12, 1965, my father, Dr. L.N. (Duke) McGillis and I arrived in Durango, Colorado. At the time, we were midway through a Grand Circle Tour of the Four Corners region. Early that evening, we saw news reports that much of South Los Angeles was in flames. On our black & white motel TV screen, “The Watts Riots” were playing out live. Each evening, for the next several days, we watched our native Los Angeles represent racial, political and economic unrest in America. The contrast between the TV images and our idyllic sojourn to Durango was obvious. 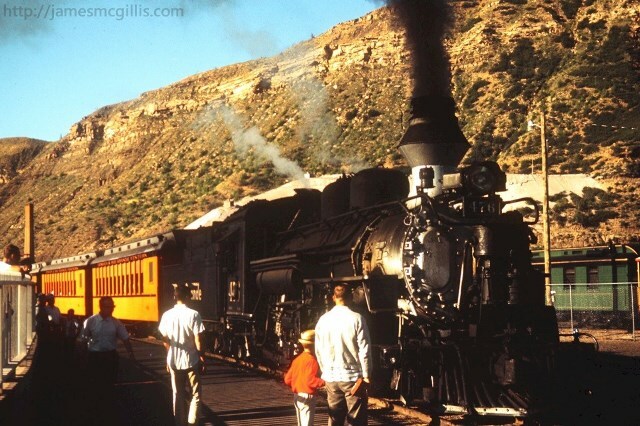 In 1881, the Denver & Rio Grande Railroad had organized the town of Durango for business, not for pleasure. In fact, Durango, Colorado was named after Durango, Mexico, one thousand miles to the south. 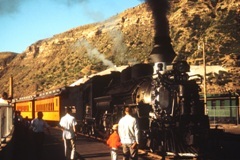 In keeping with the exuberance of the times, the company planned a rail link that would one day connect the two Durango towns. As with so many Steam Age plans, that route never came to pass. The southern branch line never extended beyond Farmington, New Mexico, fifty miles to the south. 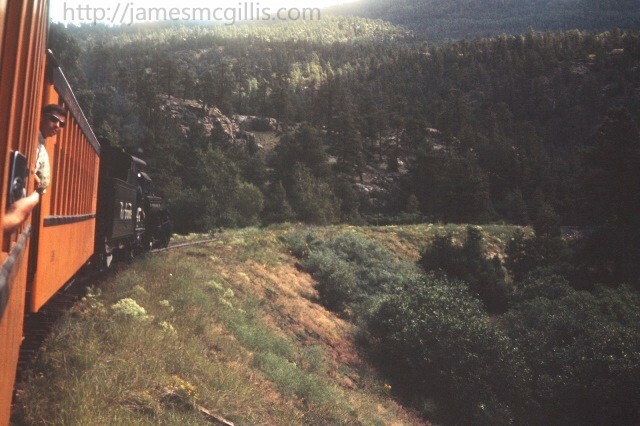 In Durango's heyday, tracks ran south to Farmington, New Mexico, east to Alamosa, and west to Mancos and Dolores, Colorado. mineral in town. 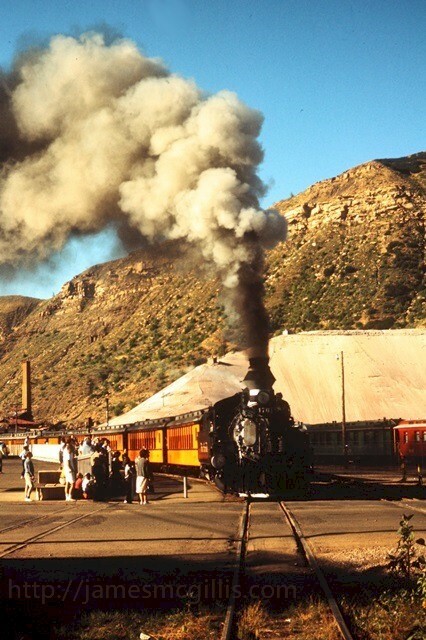 In several of our 1965 Durango Depot photos, a large white mountain sits in the background. The old American Smelter tailings pile, along with its attendant chimney was still a dangerous reminder of the uranium business in Durango. 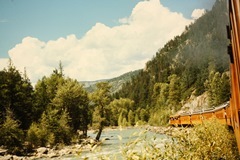 Until the early twentieth century, the Rio Grand Railroad and horse trails were the only ways to reach Durango. 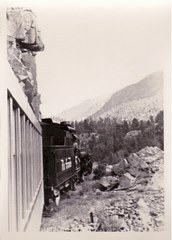 In fact, the first automobiles to enter Durango did so by train. Ringed by high mountains, watered by a perpetual stream, Durango fits nicely into the green and verdant Animas River Valley. From its beginning, Durango ranked as the dominant commercial and transportation center within the Four Corners region. Despite its strategic location, Durango did experience trouble. 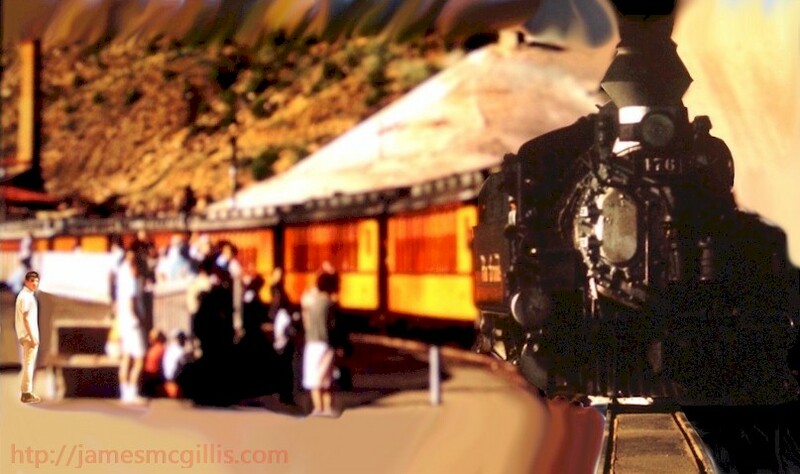 In the 1950s, as rail transportation and mining crashed, only the tourist trade kept Durango alive. During the 1960s, the population of Durango slipped from 10,530 to 10,333. 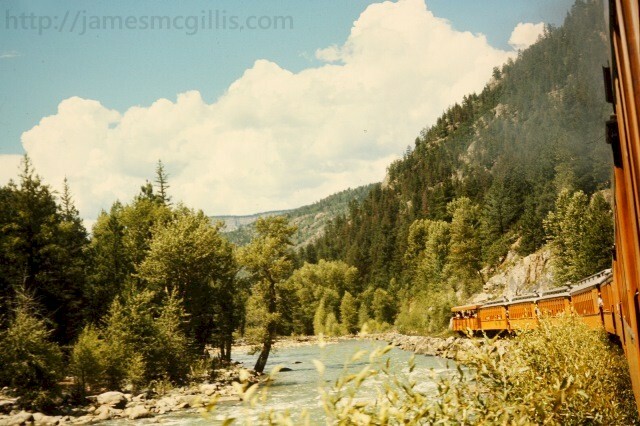 By the time of our 1965 visit, there were three “must see” attractions in and around Durango. Thirty-six miles to the west on U.S. Highway 160 was Mesa Verde National Park. Stretching north, the “The Million Dollar Highway” (U.S. Highway 550) connected Durango and Silverton, Colorado. 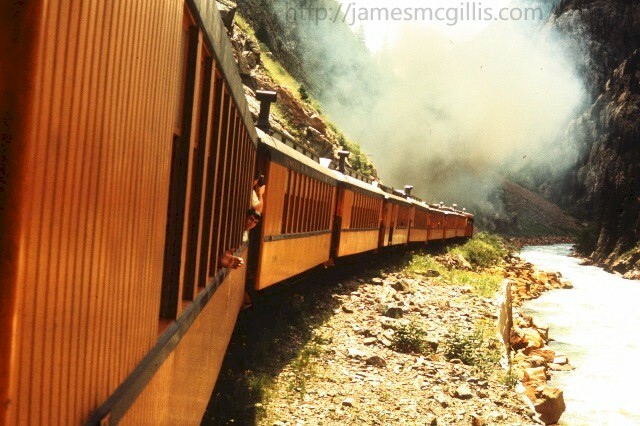 Third and most interesting to me was the narrow gauge railroad that also linked Durango and Silverton. Often called simply the “Rio Grande”, the Denver & Rio Grande Western Railroad (D&RGW) was then a company in transition. By 1968, Durango lost both its eastern and southern rail connections. 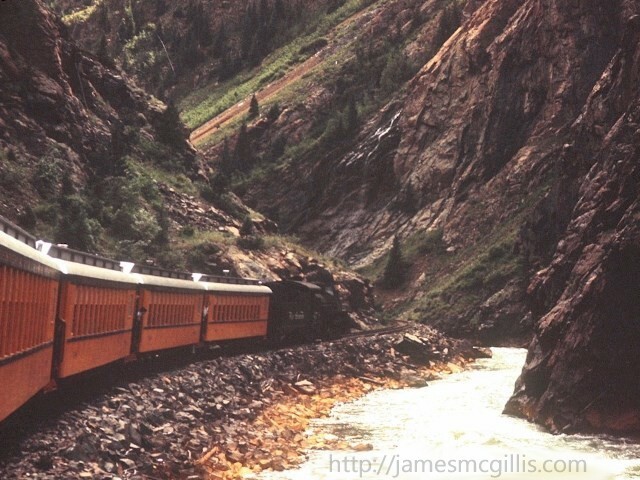 Only the Durango & Silverton line remained operational. 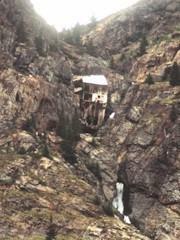 With little ore to transport and the Million Dollar Highway replacing its passenger service, the precursor to today’s Durango & Silverton Narrow Gauge Railroad struggled to survive. After visiting Mesa Verde and driving the Million Dollar Highway, there was only one thing left for us to do in Durango. 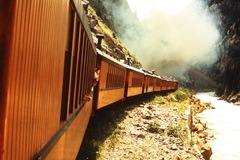 On our third day there, we traveled on the steam train from Durango to Silverton, and then back again. In those days, there was no motor coach alternative. 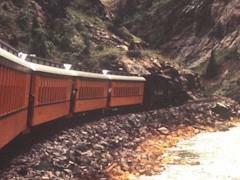 Today, passengers can take the bus from Durango to Silverton and then ride the train back to town. 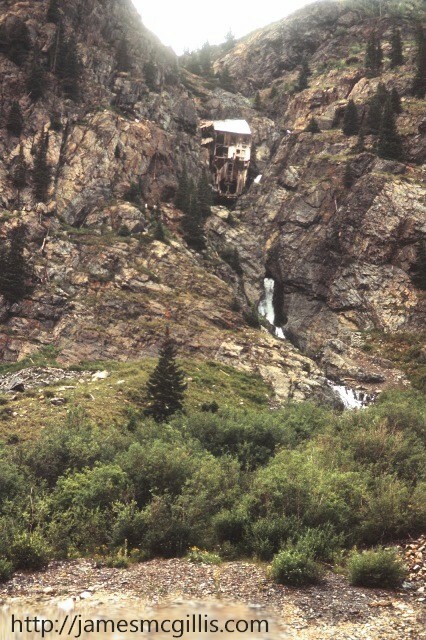 Alternatively, they can ride the train up to Silverton and then return by bus. Stalwarts and diehards ride the train in both directions.. Although we had reservations on the second train that day, we arrived early to see Engine 476 preparing to pull the early train out of the Durango Depot. Pulling a line of mismatched passenger cars, the forty-two-year-old engine continued to serve its original purpose, which was to pull passenger trains. 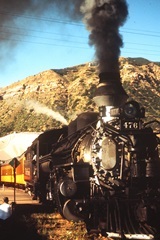 Until DRGW ended its Durango-Alamosa passenger service in 1968, Engine 476 likely served on both the Silverton and Alamosa lines. In 1923, the Schenectady Locomotive Works built ten 470 Series (or 2-8-2 K-28) for the Rio Grande Western Railroad. 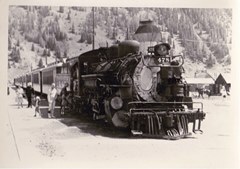 With its 2-8-2 wheel-plan, the 470 Series engines had both a lower center of gravity and higher capacity boilers than is possible with older style 2-8 wheel-plans. Sporting a diamond chimney shroud, the locomotive evoked the style of the Orient. Thoroughly modern when constructed, in 1965 Engine 476 looked every bit the “Mikado” that it was. The class name "Mikado" originates from a group of Japanese type 9700 2-8-2 locomotives, built by Baldwin Locomotive Works for the Nippon Railway of Japan in 1897. The Gilbert and Sullivan opera "The Mikado" had premiered in 1885, so the name was still on the minds of many in America, where the opera achieved great popularity. Gilbert and Sullivan’s “Modern Major-General’s Song”, in “The Pirates of Penzance”, had helped popularize the word “modern”. With great optimism about the future, the 1920s represented the epitome of modernity in American Life. As soon as the ten new K-28 engines joined the DRGW fleet, those powerful, compact Mikados became the favored engines for short-haul passenger and freight routes throughout the system. In a nod to the nacient Streamline Moderne style, their forward mounted air-brake systems and their Japanese Mikado-style chimneys fit the modernity of their time. It is sad to say that somewhere along the line; all three of the Durango & Silverton K-28 engines have lost their classic chimney shrouds. In each of their places now stand a vertical pipe and cylindrical black shroud. In the interest of historical integrity, it would be nice to see the D&SRR add historically correct diamond-stack chimney shrouds to all three remaining 470 Series Mikados. As these utilitarian engines approach their hundredth anniversary, the recreation of an authentic historical style should be a priority. 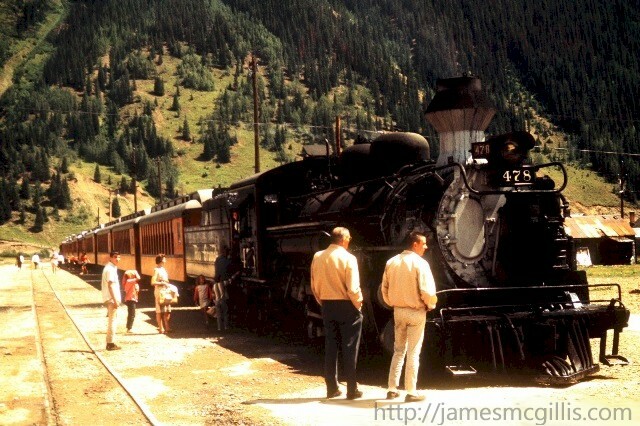 That day in 1965, as we waited for the early section to leave the Durango Depot, there was tension in the air. Upon arrival, we observed a steady stream of black coal smoke emanating from the chimney of Engine No. 476. Before we arrived that morning, the yard crew had attached the engine to the train. When the engineer finally climbed aboard Engine No. 476, we knew that the action was about to begin. 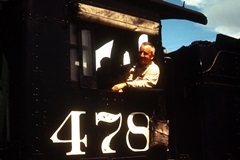 With his Nikon F 35-mm film camera ready, my father stood astride the tracks. Standing behind him and to his left, I held my vintage Mamiya 16-mm film camera at the ready. Not wanting to miss the action, we soon walked across West College Drive and then along the tracks. From our new vantage point, we would see the engine coming toward us, almost head-on. On that day in August 1965, Engine No. 476 appeared historically correct and ready to go. First, the steam powered whistle wailed. As the fireman stoked the firebox, the engineer opened the throttle valve, sending superheated steam into the cylinders, thus driving the pistons and turning the wheels. Another valve sent steam up the blast pipe and out through the chimney. That blast of steam increased the draft across the fire grate. 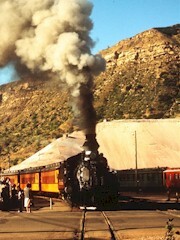 As this powering-up took place, steam and coal smoke shot high into the morning sky. Already “up to steam”, the locomotive soon began to move along the tracks. 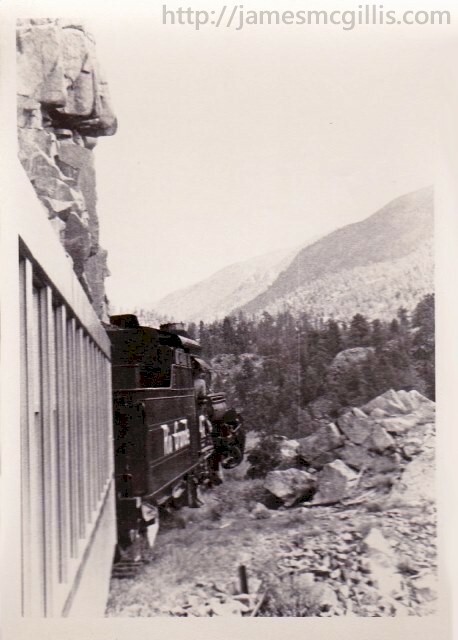 In order to capture the scene, my father had positioned himself astride the tracks. Not being as brave as he was, I positioned myself off the tracks, behind him and to his left. In those days, after snapping a picture, the photographer had to advance the film with a thumb-lever. Only after advancing the film could he snap his next picture. Once the train began to move, it accelerated more rapidly than either of us had expected. To my surprise, my father stood his ground, snapping a photo of the train as it headed straight for him. Somewhere in all of that excitement, he was able to get one more close-up of the approaching engine. 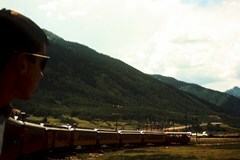 For my part, I got one shot of my father astride the tracks and another as he turned and ran. Although he was smiling in my second shot, he also appeared giddy with fear. To this day, I am not sure how close Engine No. 473 came to my father and me. Being one who has observed the sheer power of a K-28 Mikado steam engine coming toward him on the tracks, I can say that the experience is enough to instill both respect and fear. Once we had calmed down, we sauntered over to the depot. There we boarded our own train, pulled by the venerable K-28 Mikado Engine No. 478. This Part One of a two-part article. To read Part Two, Click HERE.